Geger Temple Bali is an old and sacred temple, dedicated to worshiping Ida Sang Hyang Widhi Wasa in manifestation as Ida Batara Dalem Segara or Ida Batara Dalem Pemutih. This is a holy place to pray, invoke for fertility, safety, peace and for the implementation of the nangluk mrana ritual. 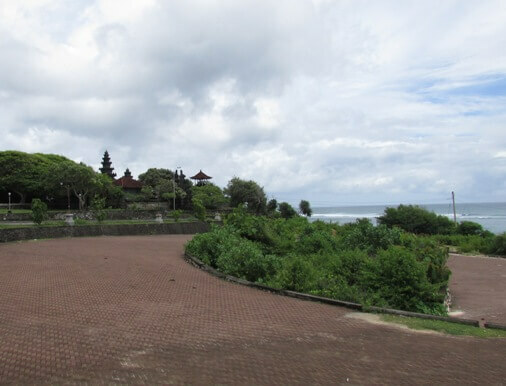 From here visitors can enjoy views around Nusa Dua and direct view to Mount Agung, Indian Ocean and Nusa Penida Islands. 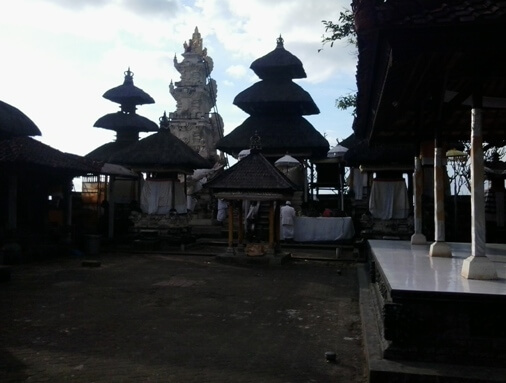 This temple is located in Peminge, South Kuta District, Badung Regency, Bali. It's less than 30 minutes from the Ngurah Rai International Airport. This spot can be easily accessed by car. Just drive south-east heading to Nusa Dua area and continue on the Jl. Raya Nusa Dua Selatan. You will pass several luxury villas and finally arrive at the entrance, the Jl. Pura Puget (Jl. Pura Geger). There are officers who will collect entrance fees, the rate is relatively cheap. Follow this road (around 650 meters) until you reach the parking area with an open view of the blue sea. This sacred temple is located at the very end, perched on a headland with a quiet and magical atmosphere. Nice place to spend hours of solitude and meditate. 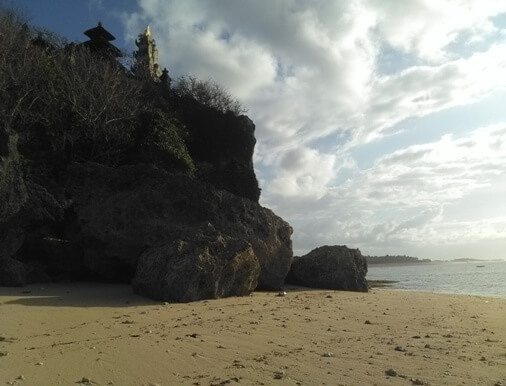 To the south is hidden a beautiful white sandy beach, called Geger Temple Beach. When high tide, sea water hit the side of the cliff and no beach at all. 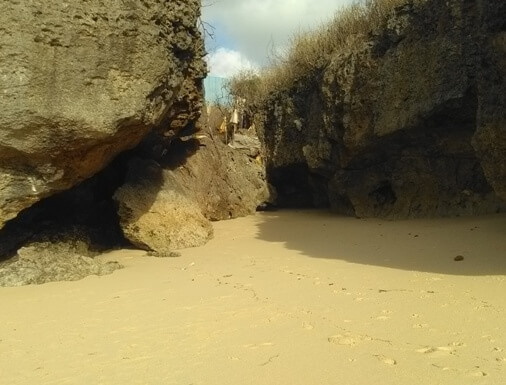 But at low tide, this is an enchanting white sandy beach, hidden at the base of a cliff with a panoramic view of the blue sea and crystal water, adorned with sea pandanus among towering rock formations. 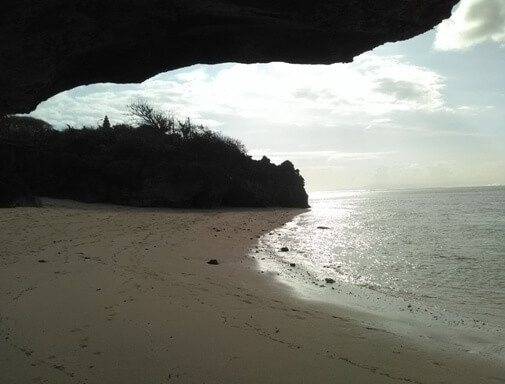 This spot is great for morning walk, watching sunrise, enjoy the sound of waves, and also the panoramic view of the calm sea with the cool sea breeze. The piodalan anniversary in this temple is celebrated a day after "Purnama Keenem", one day after the full moon of the sixth month in Balinese Calendar. Balinese will wear their traditional costumes and flock to the temple for praying. Apart from the local residents there are also those from outside the area and this can be over crowded. In addition to the purpose of praying, many come aiming to seek for "taksu balian" (spirit/energy for guidance in shamanism), for healing from illness, and for "taksu of leadership" (spirit/energy for guidance in leadership). To enter the temple area, it is good for visitors to wear cloth (kamen) and scarves. 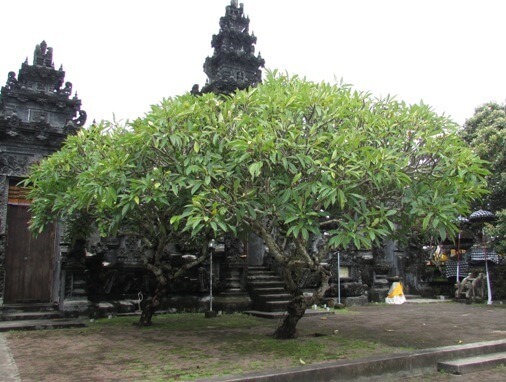 Similar to other temples, this is also a temple that is sacred and highly respected especially by Balinese. In the main area there are several pelinggih (shrine) in the form of meru tumpang tiga (storey roof) from palm fiber as a stand for Ida Batara Dalem Pemutih. There are also padmasana, some shrines, and other buildings. 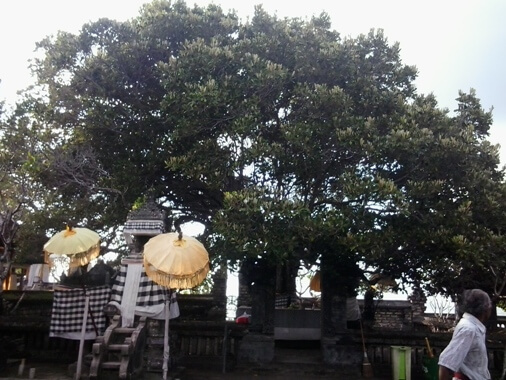 In the central part, the Sawo Kecik tree (Manilkara kauki) thrives, which is believed to have existed since old time and became part of the history of the temple. In addition there is Pura Beji, covered by the black and white checkered cloth, hidden between rocks and boulders and seen to be sacred. There is a source of springs or "kelebutan" nearby, a spot for "pengelukatan" or purification ritual. Geger Temple has been long established but not much historical references. There are sources that mention about the temple, the Manuscript of Rasmi Sancaya which is related to the Dang Hyang Nirartha, holy priest from East Java, but not explicitly mentioned. Another manuscript is the Babad Dalem Pemutih (Petak Jingga), associated with the Gelgel Kingdom in Klungkung Regency and the rebellion of Ki Maruti. The rebellion ends up in Karang Enjung, later known as Geger Temple. However, the definitive historical manuscript that is related to the history of Geger Temple has not been found also any formal publication.